It's a question that the Bible, it seems, doesn't answer: Why couldn't David build the temple? Looking for an answer? Read on. After the two hobbits, in Tolkien’s Lord of the Rings, Sam Gamgee and Frodo Baggins return from their heroing and violence-filled trip to destroy the Ring of power by casting it into the molten core of Mount Doom, the trilogy winds down with a scene that is far from a simplistic happy ending. It is almost too-honest. 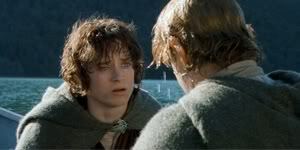 Frodo tells Sam that he is going to leave Middle Earth, and the Shire, forever, and set sail to the Undying Lands. "So I thought too, once. But I have been too deeply hurt, Sam. I tried to save the Shire, and it has been saved, but not for me. It must often be so, Sam, when things are in danger: some one has to give them up, lose them, so that others may keep them." The Return of the King: The Grey Havens, p. 209. The Shire has healed from these terrible times, but Frodo has not, and so Frodo can not stay. He can not enjoy the Shire as he once did, because he can never return to his innocence. This is the tragedy of Frodo’s heroic journey. Recently we celebrated Veteran’s Day, a time to remember the sacrifices of all those who have served in our country's military seeking the peace and freedom that we enjoy. Some lost their lives. Many of these soldiers returned from wars with medals, and stripes. But many more returned with the scars of war. Scars on their bodies and scars on their souls. Amputated limbs and amputated hearts. According to the statistics 55,000 Americans lost their life in Vietnam. Since that time twice that number -- 110,000 Vietnam veterans -- have committed suicide. A while back I was on the phone with a college roommate of mine. He is a 1st Lieutenant in the Army and was sent to Iraq just months after being married . He served there for almost a year. He told me about the bizarre and terrifying effect of being shot at, of seeing dead bodies, of having friends die. He has been back for more than a year now and he told me that he still wakes up overwhelmed with the fear that he is under attack, that someone is trying to kill him. More dramatically, one of my classmates was telling me about his uncle, who after returning from Vietnam was so distressed by what he had experienced there that he would wake up in the middle of the night terrified, and throw his wife onto the floor. These are the tragedies of war. In 1 Chronicles 22:6-10 we encounter David, grappling with the tragedy of war in his life. David is nearing the end of his life. He has enjoyed God’s blessing and apart from some significant errors, has remained faithful and humble before the Lord. God has given him great success over his enemies. As David begins to face his mortality, he sets his mind on his legacy, focusing on two things, the continuation of his kingdom and the building of a magnificent temple to for YHWH, his God. David finds his son Solomon in the courtyard of his palace, puts his arm around his son Solomon, and says, “There is something I want to tell you” and he leads him into his private chambers. David sits on his couch, and Solomon sits next him cautiously, feeling a mixture of eagerness and fear, curious what his father will say. As David gets ready to speak he thinks back to that day 20 years ago now when he was reclining on this very couch, relishing the aroma of his cedar house, overflowing with gratitude for all that God had given him, for his remarkable military successes, for his children, for God’s covenant with him. That day he was overflowing with joy, and felt compelled to go worship at tabernacle. When he stepped out of his house, and saw the tent of the tabernacle he was overcome with guilt... “How can I live in a house of cedar, while the ark of the covenant of God is in a tent?” he thought to himself. I wonder if when Solomon heard these words as joyful? Or maybe Solomon detected sadness, and disappointment in his father’s voice? David can not build God’s temple. David, who was a man after God’s own heart, Israel’s greatest king, can not build God’s temple. Have you ever been unable to do something you wanted so deeply? Maybe even something that you wanted to do to God’s glory? The natural question to ask in these circumstances is “Why, Lord?”. Why, Lord, can I not get into medical school? Why, Lord, can I not get that job? Why, Lord, can I not marry that person? Why, Lord, can I not give birth to a child? Why, Lord, can I not serve you in that position of leadership? Why, Lord, am I limited by this disability? Why, Lord, can I not build you a temple? Why, Lord, can I not enter the promised Land? I picture Moses, in the last days of his life, standing atop Mt. Nebo, gazing over the promised land longing to be there, with the words of God ringing in his ears “I have let you see it with your eyes, but you shall not cross over there.” And Moses died on that mountain, never setting foot in the promised land. Now, there was a clear reason why Moses could not enter the promised land, Moses had sinned. But what about David? 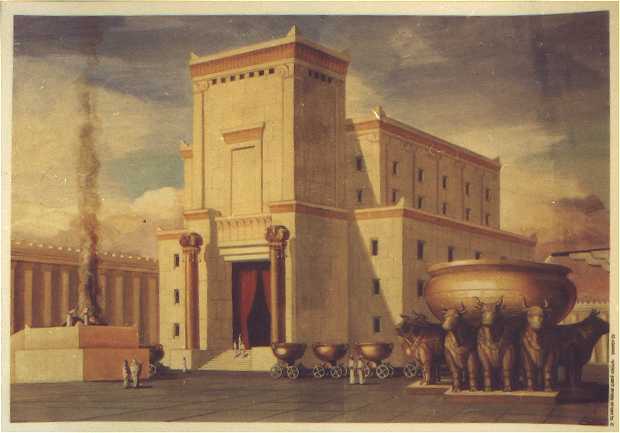 Why couldn’t David build the temple? Had he sinned? The Book of 1 Kings suggests that David was not able to build the temple because he was too busy fighting off enemies. But the Chronicler doesn’t offer this explanation. Instead, he sees a different connection between war and this inability to build the temple. David repeats to Solomon God’s words: “you have shed much blood and have waged great wars; you shall not build a house to my name, because you have shed so much blood before me”. The redundancy makes it emphatic, but not necessarily clear. We know that it is the blood, not the busyness of war that is the problem. But, why does David’s bloodshed in war prohibit him from building God’s temple? I must admit, when I first came to this text looking for a sermon, I thought I had found biblical grounds for denouncing war as unacceptable to God. I thought it was obvious that God was punishing David for a warmongering reign. Maybe I was even more attracted to this reading because of the current state of our national politics. But as I sat reading, looking for commentators to back to me up...I came across something that was rather unsettling. Instead of finding that the Chronicler was a virtual anti-war protester, I discovered that throughout the Chronicles, he gives the distinct impression that David was fighting God’s wars. Throughout the volume David is constantly being blessed by God in battle. It says that “the Lord gave victory to David wherever he went”. Needless to say, I was a bit disappointed, but even more disturbed. So it wouldn’t work to blame David for his wars as a moral fault. This is simply not what the Chronciler is suggesting. I could not attribute this restriction to a moral fault of David. But there must be some connection between the blood David shed in war and God’s restriction. The text is clear: his war and bloodshed disqualify him. I believe the connection we are looking for is in ritual purity laws. Numbers 31 commands soldiers returning from battle, those who had killed someone, or touched a corpse, to stay outside the camp for seven days, and to do purity rituals on the 3rd and 7th days. So there is some precedent for believing that war has a way of making warriors impure. David was not guilty but he was dirty. But this isn’t a very satisfying answer, because these men of war were eventually purified and returned to the life of the community. Why could David not be purified?! This creates a problem for me!! How could it be that David is restricted from building God’s temple, when all he had done was fight God’s wars? How could God support David’s wars and then tell him that they disqualified him for building the temple? There is no real satisfying answer to this troubling question. It is simply the tragedy of David’s life. Even as God’s obedient servant, God’s warrior, David had become unclean. David was not guilty, but he was dirty. And that dirtiness, prevented him from fulfilling one of his greatest, and most noble dreams...building the temple of God. What tragedy. Life is that way. You live and you get dirty. Even if you live in obedience to God, you get dirty. War is perhaps one of the dirtiest things in life. And our dirt limits us. We are limited by our experiences, our relationships, our choices, the choices of others, our genders, our bodies, our injuries, our IQ’s, our socio-economic standing. Life is dirty and our dirt limits us and there is deep tragedy in that. But even in the face of these tragic limitations, God offers consolation. God’s promise about Solomon is not a taunt to David, but a great word of hope. God’s blessing and covenant will be with Solomon. God will adopt him as son, even as he had adopted David as son. Solomon will build a house for the name of the Lord, and God will establish his kingdom. God’s offer of hope does not deny the tragic truth of today, but it looks to the future. It is a redemptive view. Remember Frodo’s words to Sam: “I tried to save the Shire, and it has been saved, but not for me. It must often be so, Sam, when things are in danger: some one has to give them up, lose them, so that others may keep them." He looked beyond his own tragic loss of the Shire forever and found consolation in knowing that he had given many others the chance to enjoy it. How is God directing your eyes to the future and toward the benefit of others? What is God’s offer of hope to you? Where is God’s consolation? Could it be God who makes successful and generous businessmen of those who couldn’t get into medical school? Could it be God who provides dear friends to the single? Could it be God who offers adoption to the infertile? Could it be God who allows us to encourage those who have suffered what we have suffered? Could it be God who allows us to care for and mentor those who will do what we can not? Could it be God who allows us to look out at the promised land, and to train others who will lead God’s people as they cross over? Could it be God who allowed David to win peace and great wealth and give him a son, so that he might build God’s temple? Life is unavoidably full of tragedy for us. But just as sure as tragedy is God’s persistent and redemptive offer of consolation. May we learn to see God’s consolation when our dreams remain unfulfilled. Why, Lord, must we face the tragedies of life? Perhaps we may never know. But we praise you for your redemptive consolation. Give us eyes to see it, and hearts to receive it. Provocative. Perhaps the answer lay in "Let him who boast, boast in the Lord." God will not share his glory with anyone. The simple fact is that David shed blood when he didn't have to. He aligned himself with Achish outside of the expressed will of God. He led raids that killed men, women and children. At times he killed outside of the will of God (ex. Bathsheba's husband). Anonymous June 3. Clearly killing Bathsheba's husband was a sin. But you won't find the Chronicler attributing God's prohibition on him building the temple to sinful bloodshed of any kind.